2008 Artur Hakobyan’s book “Kochar’s Graphic Art” is published (in Russian). 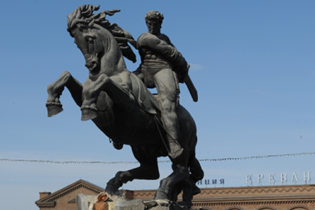 2009 The five times magnified bronze statue of Kotchar’s ”Biblical David” is placed in the yard of the National Assembly, Yerevan. 2010 On 4-20 of June a jubilee exhibition “I Rely on Time” dedicated to Kochar’s 110th birthday opens in the Artist’s House of Armenia. In the State Pushkin Museum of Fine Arts in Moscow (15.09 – 15.11) opens exhibition “Two colors of the rainbow – two destinies reflection…” in which were included Kochar’s two works from series “Painting in Space”. 2011 Increased copy of Kochar’s “Yerevan-Erebouni” is installed in the foyer of the new building of Matenadaran. In April Kochar’s Painting in Space “First Sin” (1927) is exhibited at National Gallery of Armenia. 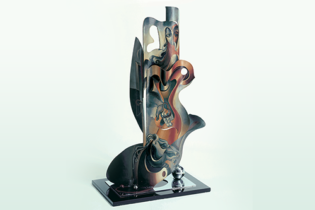 In July Kochar’s 10 works are exhibited at Exhibition “Dali & Surrealists” at National Gallery of Armenia. 2012 In April, at the exhibition “ArtMonaco-Expo”, sponsored by the royal family of Monaco, the Painting in Space “First Sin” (1927) is awarded with main prize “Prix de l’excellence” in nomination “Baroque” as the work having considerable influence on development of Art of 20th century. An exhibition called “The Diaspora of the Armenian Book 1512-2012”, opens (12.06-09.09) at Special Collections of the University of Amsterdam Library in which were included Kochar’s “Voskan Erevantsi” (1946) and the Painting in Space “Yerevan-Erebouni” (1968). 2013 An exhibition called “Modernités Plurielles 1905- 1970” (“Plural Modernities from 1905 – 1970”) opens in October at Modern Art Museum (Centre Georges Pompidou) in Paris in which was included Kochar’s painting “Eastern Women” (1926). Ararat Aghasyan’s trilingual Album “In Yervand Kochar’s Space” is published.